What is a Royalty Compliance Inspection? When should a Royalty Compliance Inspection take place? What qualifications should I look for in choosing a Compliance Inspection Company? How will the Compliance Inspector know what to look for and where to look? royalty reports. We want to know specific infractions and the dollar impact of each infraction. something that will be looked at during the course of the Compliance Inspection? to sell that particular item. How will this be addressed in the Compliance Inspection? are advertising the property as required in the Licensing Agreement. Inspection, the Licensee will feel like they are being singled out, thereby jeopardizing our relationship. What accounts for the majority of underpayments? the POS or cash register? As a regular course of business our Licensee gives out free samples of the product to potential customers. Are we due royalties on these free samples? What is the typical approach that Royalties, Inc. takes when performing a Royalty Compliance Inspection? the royalties that are due your company, but that all of the reporting provisions of the Licensing Agreement are being adhered to. • Assurance from the onset, that royalties are being calculated, reported and paid as outlined by the Licensing Agreement. ◦ Adherence to advertising commitments, etc. • That precedence is set not only to this Licensee, but to all Licensees that under-reporting will not be tolerated and will be monitored on a regular basis. Subsequent Compliance Inspections should be performed about every two years to assure continued compliance. You should look for a company that has a strong background in accounting, royalty compliance and licensing. The more knowledgeable the inspector is in the particular industry being inspected, the better. 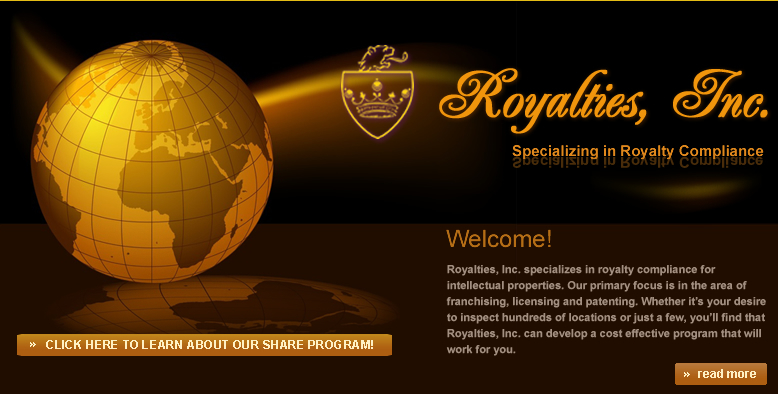 At Royalties, Inc., our approach is to begin with a detailed interview with the Licensor. During this interview we learn as much about the licensing company and its licensed products as possible. We also obtain as much information as is available on the licensees. Typically, the licensor will have some areas of concern that they would like us to look into. We take the information provided by the licensor and combine it with our own Compliance Inspection expertise to track sales, shipments, transfers and production of the licensed goods. We had a CPA firm do an audit for us and they only provided us with information on the reasonableness of the royalty reports. We want to know specific infractions and the dollar impact of each infraction. Since Royalties, Inc. is a “Royalty Compliance Inspection firm” not a “CPA firm”, we take a completely different approach than your typical CPA firm would take. Our primary objective is to uncover under-reported royalties and report them to the Licensor, while at the same time providing supporting documentation of the under-reporting. Depending on the nature of the Compliance Inspection we might look at “all” invoices during the period being inspected to assure that all sales of the licensed property have been adequately reported. If we were doing Compliance Inspection a specific licensed technology, then we would look at “all” production reports on a machine using the licensed technology. Each Compliance Inspection will be tailored to the specific licensed property involved and hard copy proof would be provided on infractions. If the License Agreement allows for the copying of the Licensees documents, then we will make copies. If the Licensing Agreement does not allow for making copies, we will provide a detail listing of each infraction. A court order may be needed to obtain the actual copies. We’ve had complaints from one of our licensees that another of our licensees is selling in their territory. Is this something that will be looked at during the course of the Compliance Inspection? The first objective in performing the Compliance Inspection is to determine if all royalties due have been paid. The second objective is to determine if there are other infractions to the Licensing Agreement that need to be addressed. During our initial interview with the Licensee, we will inquire as to what depth they want us to inspect non-royalty related infractions and will inspect based upon the Licensor’s request. We’ve discovered that one of our licensees is selling a product with our licensing designs on it, but is not licensed to sell that particular item. How will this be addressed in the Compliance Inspection? We will look at production and sales reports to determine when the unlicensed product entered the market. We will then determine the number of units produced and sold and provide our findings to the Licensor. We will point out to the Licensee that the item is not authorized under the current License Agreement and the production should cease immediately. We will also recommend that the Licensee contact the Licensor to begin the necessary steps to get the item added to the License Agreement. We licensed our designs to our Licensee with the agreement that they would spend “x” number of dollars on advertising. Based on the low amount of royalties that we are receiving, I find it hard to believe that they are advertising the property as required in the Licensing Agreement. During the Compliance Inspection process, we will track the amount spent on advertising. If the Licensee had not fulfilled the contractual amount, then the Licensor will need to determine how they want to address the issue with the Licensee. The term of the Licensing Agreement ended recently with one of our Licensees. We suspect that they had remaining inventory is stock as of the end of the agreement. We have not received any royalties or royalty reports since the expiration of the agreement. How can we determine if any additional product was sold beyond the termination date? During the Compliance Inspection process, we will look at the inventory levels of the licensed products at the end of the licensed term, as well as current inventory levels. We will inquire as to the disposition of the inventory and ask for written documentation. If it is determined that the remaining inventory was sold, regardless of the price, we will provide documentation to the Licensor, along with a calculation of the additional royalties due. The royalties that we receive from our Licensees are a big part of our corporate revenue. It is important to us that we maintain a friendly relationship with our licensees, but at the same time make it clear that we will not tolerate infractions of our Licensing Agreement. We’re afraid that if we perform a Royalty Compliance Inspection, the Licensee will feel like they are being singled out, thereby jeopardizing our relationship. We recommend that once you’ve made the decision to use Royalties, Inc. to perform your Royalty Compliance Inspections, that you send written notification to ALL of your Licensees informing them of your partnership with Royalties, Inc. and your desire to inspect each location at least once during their contract period. This lets them know that everyone will be inspected at some point. When we perform a Royalty Compliance Inspection, we do it in a very friendly, non-intrusive manner. Although our contract is with the Licensor, it is also our objective to help the licensee identify any problem areas that may be causing them to under-report and help them correct the problems. I recently went into a retail store and saw a design with one of our licensed characters on it. It was produced by one of our licensees; however, that particular design was not approved under the Licensing Agreement. If you provide us with copies of the artwork authorized under this particular licensing agreement, we will compare it to the artwork that is on file with the licensee. If royalties have not been calculated on the sales, we will calculate them. We will also instruct the Licensee to stop production until the artwork has been approved by the Licensor. In the case of a retail operation, how do you catch under-reporting if they’re not running the sales through the POS or cash register? If they deposit the additional revenue into their bank account, we’ll catch it on the cash test. However, the way that most of under-reporting in a retail operation is detected is by performing a “product usage test.” We do this by calculating the net change in inventory, as compared to reported sales. As a regular course of business our Licensee gives out free samples of the product to potential customers. Are we due royalties on these free samples? The answer to this question is determined by the wording in the License Agreement. If your agreement states that you will be paid royalties based on sales, then the answer is no. If it states that you will be paid royalties based on production or shipment, then the answer is yes. We always review the Licensing Agreement to determine how “sample” items should be addressed. • Provide the Licensor a quote on the cost of doing the inspections. This will typically have three components depending on level of detail required by the Licensor. • Licensor would notify all locations of the partnership with Royalties, Inc. and let them know that it is the Licensor’s “intention” to inspect each location at least once during their contract period. Licensor would also let the Licensees know that they will be notified individually as to when their location will be scheduled for inspection. • Licensor notifies locations to be inspected. • Royalties, Inc. contacts Licensee’s to let them know the specific information needed for their inspections and to schedule a mutually convenient time to do the inspection. • The inspection is performed by Royalties, Inc.
• An inspection report and invoice is sent to the Licensor. • Payment is made to Royalties, Inc. within the time frame specified in the contract.